We have had the opportunity to observe the growth and development of four sun bear cubs born at the San Diego Zoo, enabling us to closely study the relationship between sun bear mother and offspring, and the development of sun bear cubs from birth until weaning. This adds to the limited body of information about the smallest of bear species and lends insight into the bear family tree. Sun bears do not breed well in zoos, and only four Bornean sun bear cubs have been born and survived in North America in the last decade, all at the San Diego Zoo. Through collaborative studies, our Reproductive Sciences team has worked to describe the estrous cycle of female sun bears in order to better identify the optimal time for breeding. We have used artificial reproduction techniques to evaluate males, and assessed behavioral components of male-female interactions to improve reproductive management in this species. Human-produced noise is a common feature in many landscapes, but the biological impact of manmade noise on wildlife is not well documented. As part of a broader program focused on sensory ecology, our Recovery Ecology team assessed the impact of ambient noise on the behavior of a zoo-housed sun bear mother with her newborn cub. In Malaysia, sun bears are subject to the pet trade, and bear-human conflict has become increasingly common, as bear habitat is lost. Our Global Partnerships team has worked with our partners to develop an educational curriculum that would increase awareness of the sun bear’s needs and status in Asia. We hope to build support for sun bear conservation among those people who are most likely to encounter them. 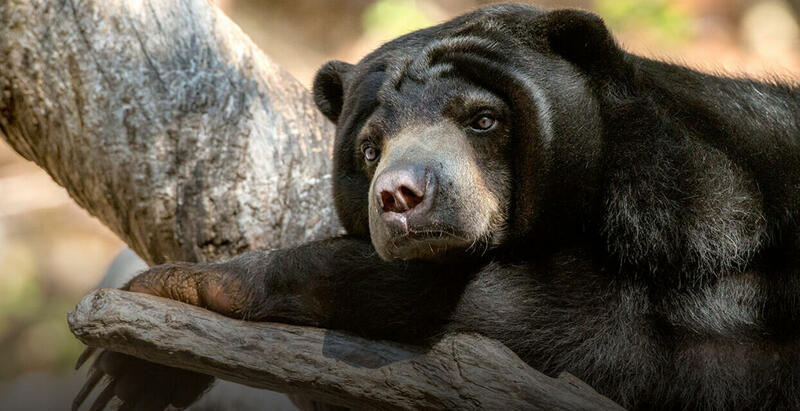 Sun bears are increasingly vulnerable to extinction due to habitat loss, and one of the leading drivers of habitat loss is land conversion for agriculture in Southeast Asia. Palm oil is a major crop contributing to this land conversion. San Diego Zoo Global recognizes the role palm oil has played in the developing conservation crisis impacting sun bears and other wildlife. We have recently joined the Roundtable on Sustainable Palm Oil, an effort aimed at encouraging the development of sustainable practices for the palm oil industry that will benefit imperiled wildlife and their habitats. Southeast Asia has two species of bear, the sun bear and Asiatic black bear. Both species are unique, fascinating and not as well-known as bears such as the American black bear.